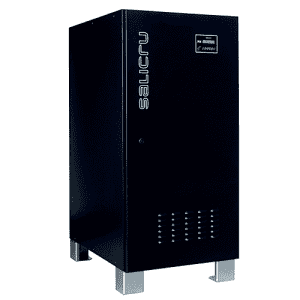 The EMi3 power conditioner series is a stabilizer, which due to its simplicity, reliability and robustness, has achieved to persist along the time, but with a re-designing, which has given technical improvements in electrical, electronic and mechanical. 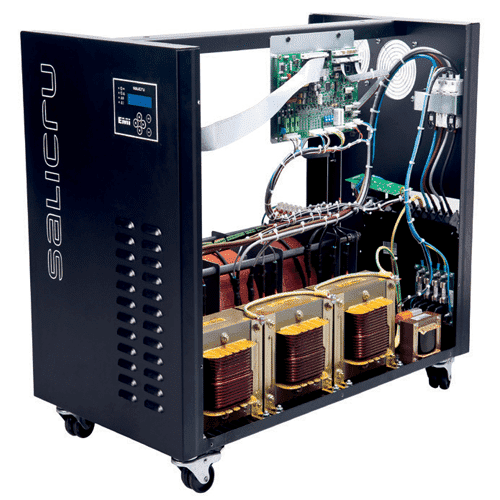 The equipment can be used to stabilize the power supply of any kind of machine, which doesn’t require a regulation with a high response time, but it requires a constant and accurate stabilization, in particular, those ones tending to be complicated: high startup inrush currents, high reactive power, high powers,…etc. 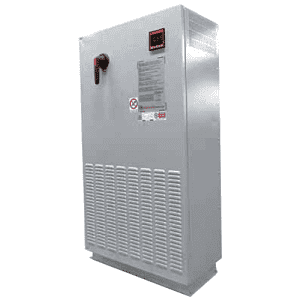 The equipment makes a sensitive and efficient stabilization of the output voltage through its incorporated Booster transformer, Variac and microprocessor. To keep the output stable with a minimum tolerance, the servosystem uses a control of the DC motor by means of MOSFET transistors. 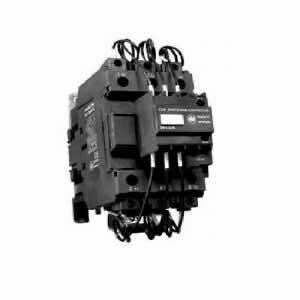 • Wide range of powers for single and three phase installations. • Toroidal autotransformers (Variacs) for all the power range, fast and efficient with DC motors of 12 V or 24 V.
• Output accuracy, better than 1 % (adjustable). 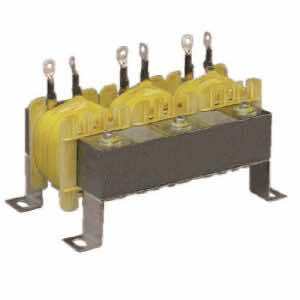 • Depending on the three-phase equipments model common and independent regulation per phase, they are immune to unbalanced loads. 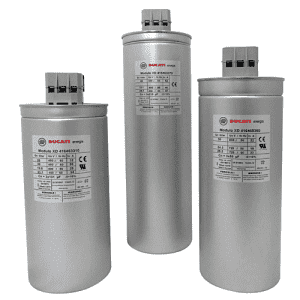 • As standard, input voltage range of ±15 %, being able to manufacture ranges up to ±30 %.• High efficiency, up to 97,5 %. 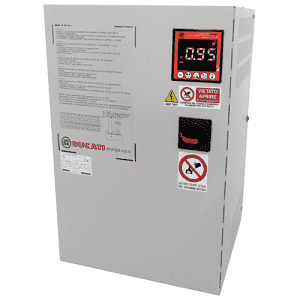 • High response time, up to 70 V/sec. 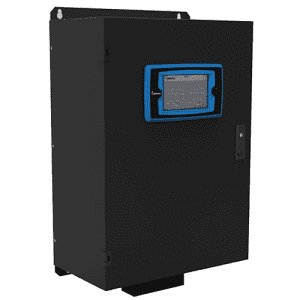 • Complete control panel with LCD to supervise the stabilizer. • Output accuracy guaranteed by a control with MOSFET servo. • Immune to line voltage harmonics; True RMS stabilization. 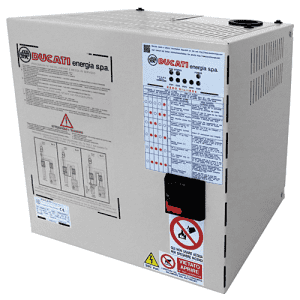 • Stable operating against load and/or voltage fluctuations. 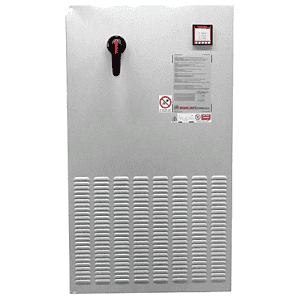 • Wide operating temperature ranges(–10 ºC.. +55 ºC). • Dry contacts (2 as standard up to 11 as an option). • Nil voltage harmonic re-injection. • Optimized mechanical design, easy maintenance. • Overload up to 200 % over the nominal for 20 sec..
• High robustness and reliability (high MTBF). • Recyclable material in more than 80 %. Maximum operating altitude 2,400 m.a.s.l. 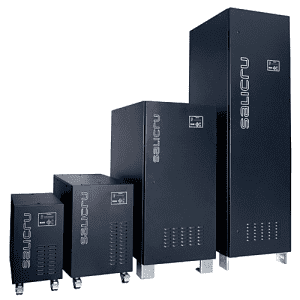 Nomenclature, dimensions and weights for models: Input 230 V 50 Hz / Output 230 V 50 Hz and input range +/-15%. – From 15 kVA to 110 kVA: Input 3×400 V 50 Hz / Output 3×400 V 50 Hz, input range +/-15% and common regulation. (Independent regulation per phase available on request). 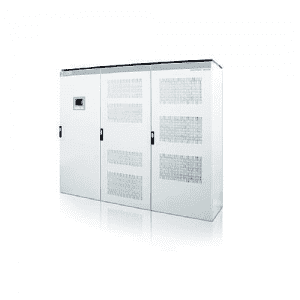 – From 140 kVA to 330 kVA: Input 3×400 V 50 Hz / Output 3×400 V 50 Hz, input range +/-15% and independent regulation per phase. (1) Others powers upon request.